The origin of my adult interest in cooking and gardening is time spent in a motel room in Thomasville, Georgia while implementing a logistics project at a large, nearby mining and manufacturing company. I’d go into the plant early and stay late, returning home to Iowa only every other weekend. When I got back to my room, I turned on the television and fell asleep watching the TV Food Network. That’s not to say experiences with my mother and grandmother played no role. They did, especially in our kitchen on Marquette Street where Mother prepared meals using familiar ingredients both fresh and prepared, and at Grandmother’s kitchen — first at the Lend-A-Hand and then at the Mississippi Hotel. Rather than sustenance, food became an escape in my adult years. In the 1990s I escaped into the T.V. During thirty minute segments I could forget extreme poverty and plain family restaurants that served a meat and three sides in rural Georgia, and engage in personality chefs who enjoyed what they were doing as locals did not. I had no kitchen so the interest was intellectual. I did learn techniques, some of which I would use later in our home kitchen. We don’t get Food Network any longer but it set me on a course for being the kind of home cook I am today. 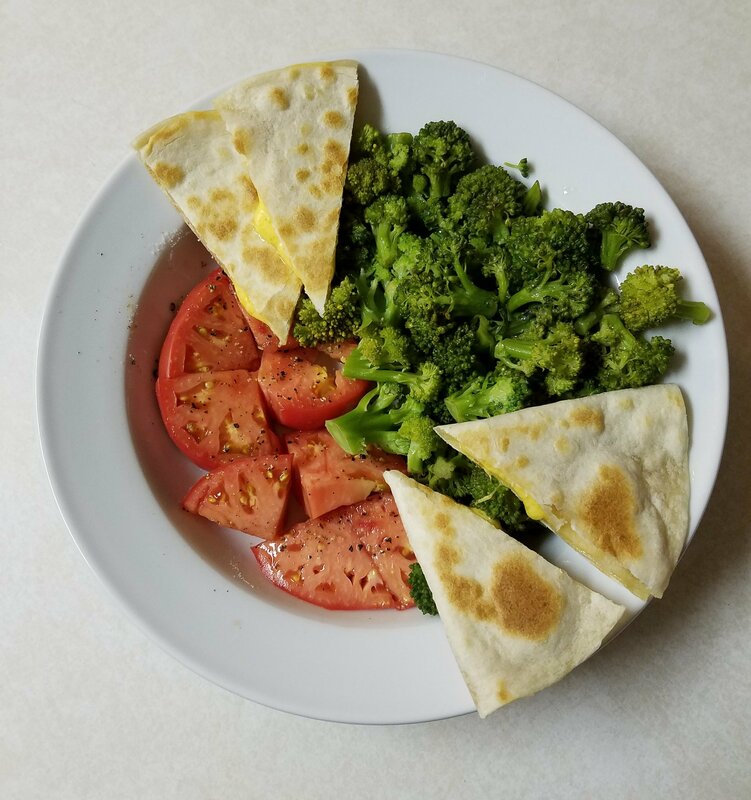 Yesterday I made breakfast of steamed broccoli, fresh tomatoes and quesadilla — a gardener’s breakfast. In a social climate of political turmoil, disease, famine and extreme weather events food continues to represent escape as well as nourishment. Producing local food and dishes is a way of navigating diverse interests in a society that seems to have gone mad. Not only escape, but protection of who we are from those who would change us. In western culture we begin each day with choices about food. The lesson I learned in Georgia, on the T.V. and in family kitchens is to choose fresh and local in order to sustain our lives, and there’s more. Make something of our choices. For a brief moment yesterday it was a gardener’s breakfast. Now to turn to today. This entry was posted in Cooking, Garden, Local Food and tagged cooking, Garden, homelife, local food, sustainability. Bookmark the permalink.